Four men have have been jailed for their part in supplying and selling cannabis to students in Southampton. Police seized drugs worth £10,000 being transported to the city in September 2018. The group's leader, Sylwester Idziak, 30, was later arrested by armed police. Three other men were jailed for between 13 months and six years four months. Southampton Crown Court heard police had the men under surveillance from April 2018. Prosecutor Jane Rowley described Polish-national Idziak, of Winchester Road, Southampton, as the "lynchpin who masterminded the operation". Phone records linked him with the other defendants and he was monitored having a meeting with Shey Roberts in Andover in April 2018. 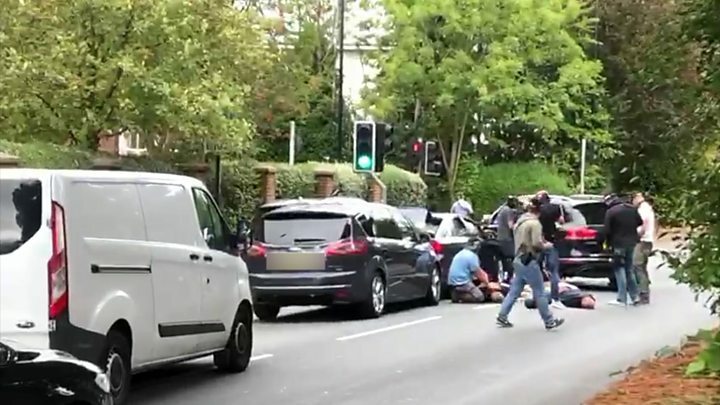 He was arrested after armed police stopped a car in Archers Road in Southampton on 11 September, in an operation witnessed and filmed by passers-by. A firing pistol which had been modified to become a working firearm, as well as ammunition, was recovered from the car. He was convicted of conspiring to supply cannabis and possessing a firearm following an earlier trial. Pole Michal Lasak, of King George's Avenue, was arrested by police on the M3 earlier in September with a baseball bat and a kilo of cannabis with an estimated street value of £10,000. He was described as a "general runner and transporter" and was given 13 months in jail after admitting conspiracy to supply cannabis and possession of an offensive weapon. The court heard Shey Roberts, of Juniper Close, Andover, supplied the drugs to Idziak. He was convicted of conspiracy to supply cannabis and sentenced to 18 months in prison. Ethiopian-born Simon Tekle, of Newcombe Road, pleaded guilty to conspiracy to supply cannabis and possession of a firearm. He was arrested at his home shortly after Idziak was detained and 25 bags of cannabis ready to be sold were discovered in his flat. The court heard he was supplying the drug to fellow university students and other users. He was jailed for six months and four months. Passing sentence, Judge Christopher Parker said the four were "a determined and organised criminal network with aspirations to grow".